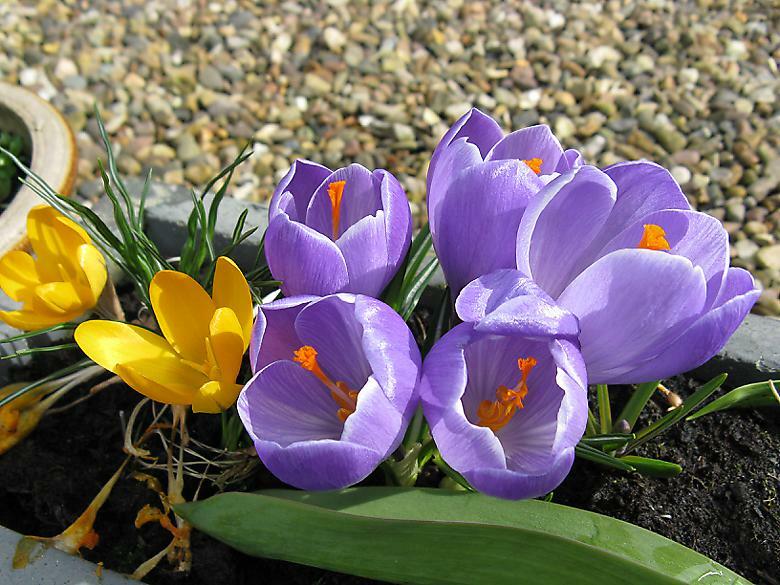 My own crocuses that I had in a container flowered well, but the ones in the garden were a disappointment as there was only three or four flowers. 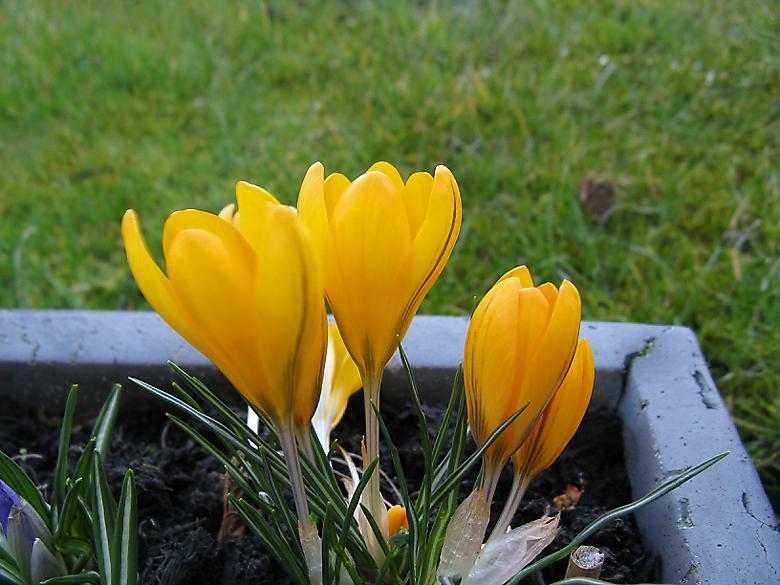 First crocus out on the 2nd of the month. 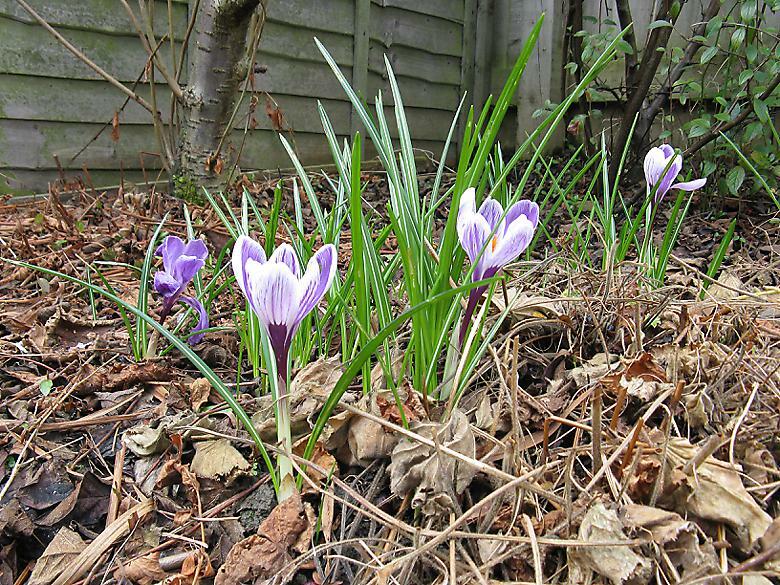 A mention to the crocus growing along the side of the house. There is something wrong with this stretch of ground as everything is growing very badly here, even the weeds. 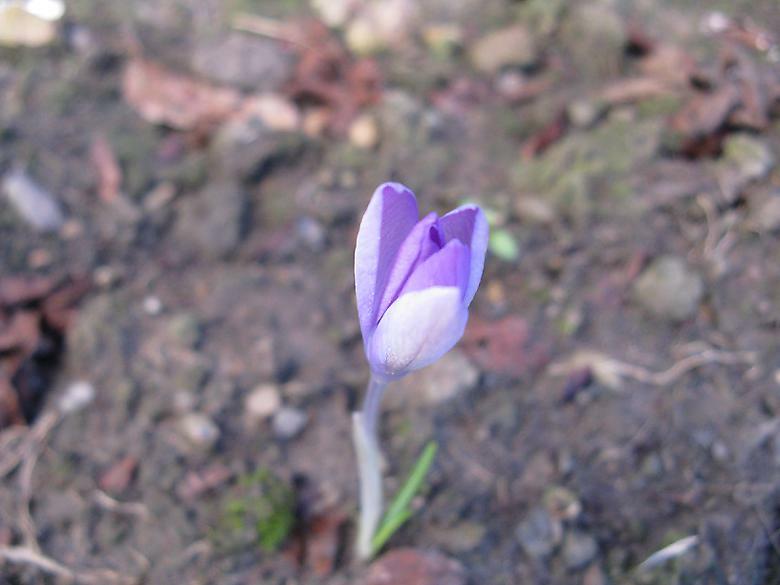 Well this little crocus has hardly got any leaves, but it still managed to produce a flower, unlike many of its more healthy looking brethren in the main garden. 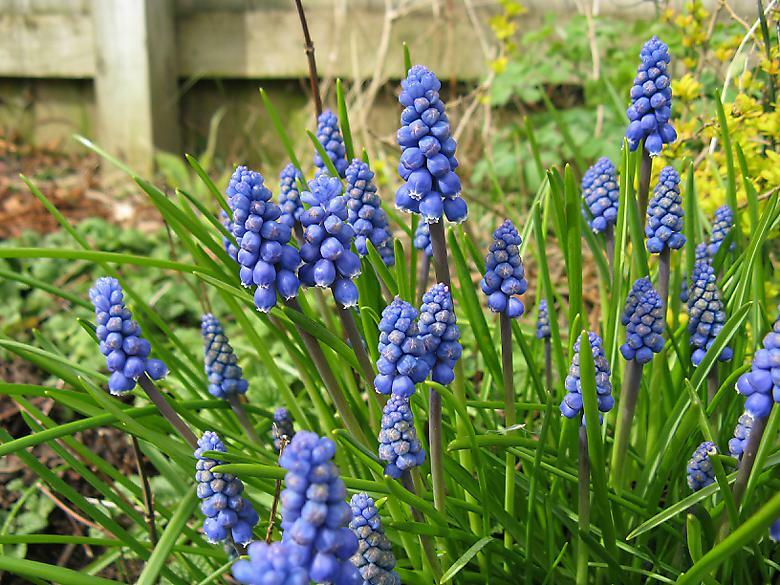 At the end of the month the muscari that were already in the garden were just getting into their stride with flowers quickly rising up. I'm sure that they will continue putting on a good show during April. The ones I planted are showing flower buds but will not be fully out until next month. 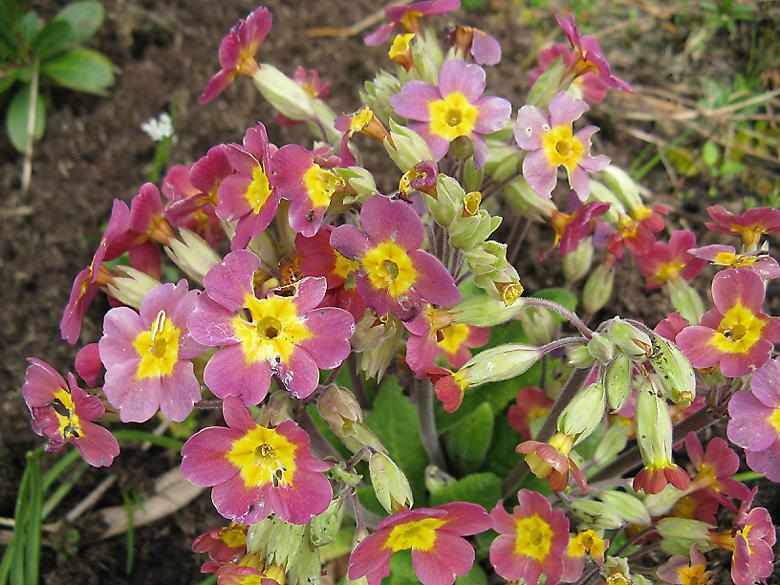 The primroses should get a mention, there are not many in flower but they are worthy of a couple of pictures. Something does appear to be eating the flowers though, as you can see. 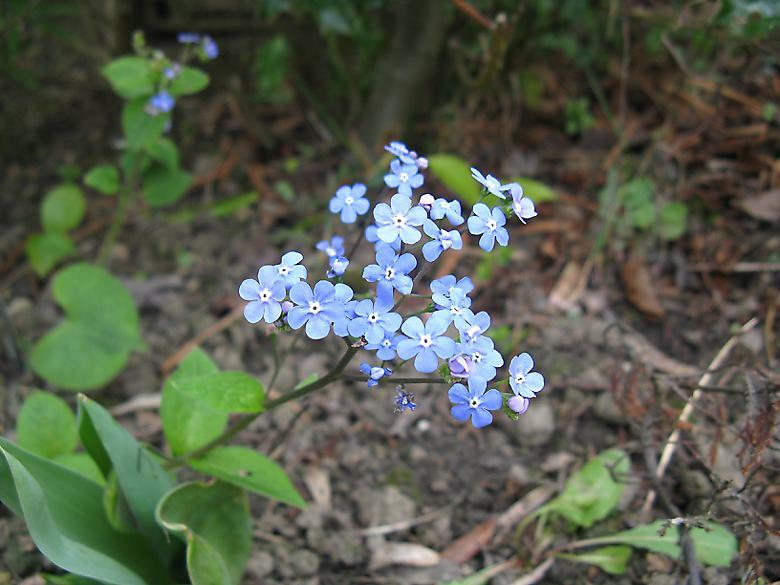 I identified a plant that has sprays of small blue flowers like a forget-me-not as a Brunnera. 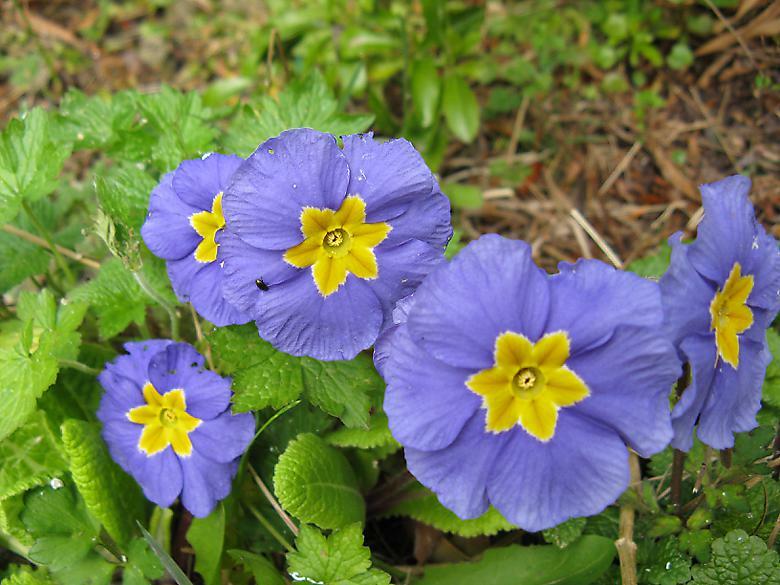 In the garden center there was a variety named Brunnera macrophylla 'Hadspen Cream' which is almost exactly like the one I have. Some of them have lost their variegated leaves though. This appeared, I don't know what it is yet. 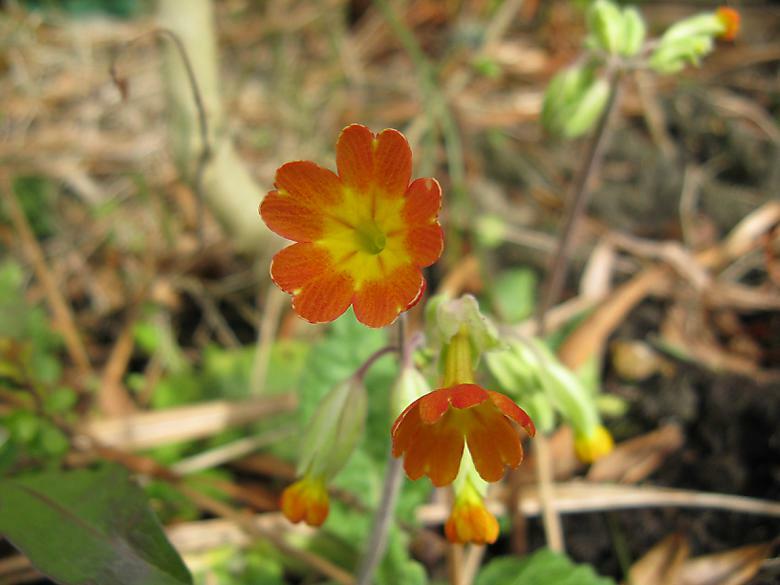 It is growing very quickly, there are a few of them in the right hand border. 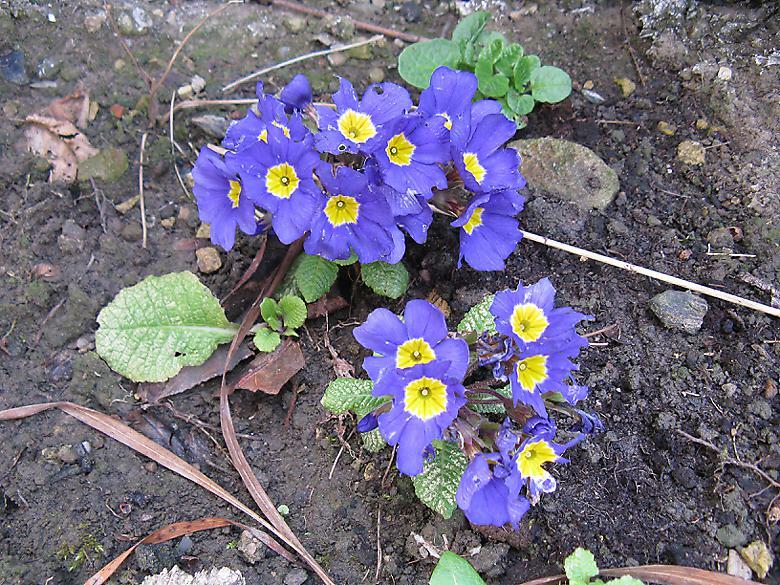 I dug out part of a clump of plants to plant some of my bulbs. At the very front of that area there were a few shoots showing, that did not progress for a long time. Now suddenly they are racing ahead and similar shoots appearing everywhere. 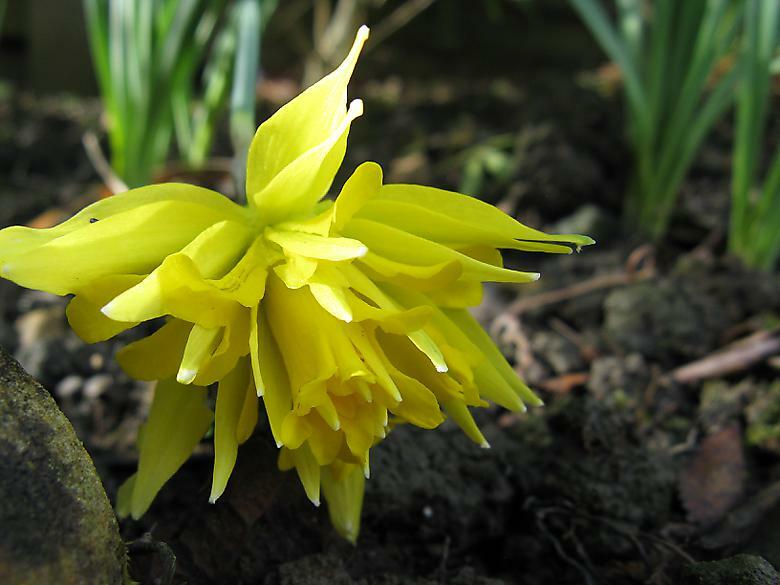 One of the shrubs by the side of the house turns out to be a Forsythia and had a few flowers, it is still small yet. 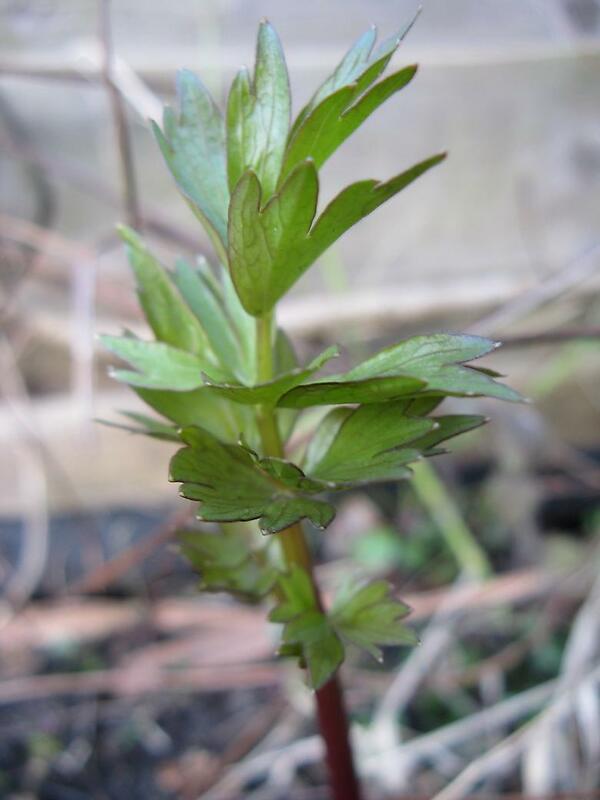 The shrub I thought might be a dogwood (Update: after seeing the flowers I believe that this is a Kerria japonica) is starting to leaf, and also is covered in flower buds, they are not fully out yet, but it appears that they are going to be yellow. I removed the cube shaped hedge and discovered a label that showed it was a Lonicera nitida "Baggensen's Gold" I also removed the rush by chopping it up and removing in small pieces from the waterlogged ground. It was very big and so I've kept it to dry out and it will be returned to the garden to compost later once it shows no signs of growing. 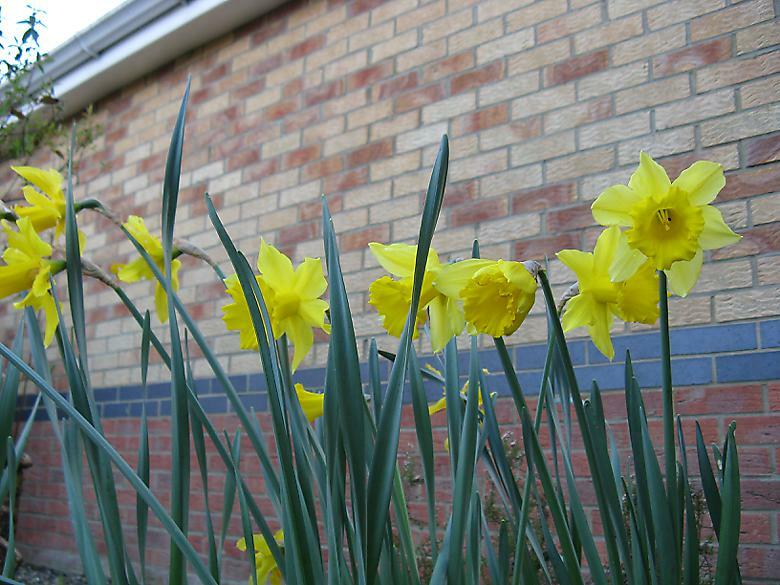 The leaves had already mostly been chopped up and spread around the garden. Started to prune back the winter jasmine now that the flowers have finished.